Salt Lake City has joined a global network of co-working communities called Impact Hub. Start-ups and social enterprises —as well as freelancers, lawyers, and anyone who wants a space to work and network—pay for a membership that gives them access to the building (located at 150 S. State). Inside, a large, open space is filled with tables and chairs, private offices, conference rooms and lounge areas. Construction has started on a cafe as well, which will be open to the public. The hub's mission is threefold: Providing a flexible space for co-working, developing a networking ecosystem and teaching new entrepreneur. 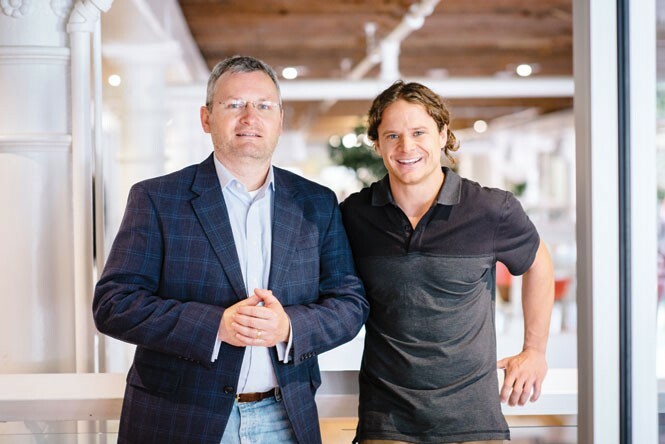 Dustin Haggett (pictured right) joined Impact Hub in San Francisco, and when he moved back to Salt Lake City, met Søren Simonsen (pictured left), the two spent the next two-and-a-half years opening the downtown Impact Hub (SaltLake.ImpactHub.net). What is behind Impact Hub's unique design? Søren Simonsen: We want it to be our own space and personalize it, but we had a great building to work with that's very authentic, and we wanted to keep what we could and keep it visible: A lot of exposed brick, exposed joist, the decorative cast-iron columns, the hardwood floors (as with leather, its blemishes become character-defining). We involved the community in the design of the space. We had a number of workshops with our early members, and we talked about how we want this to look, how we want it to feel, what are some of the features. SS: It has been modernized. It's a very energy-efficient building. All of our lighting is LED. We have very energy-efficient heating and cooling in the building, a lot of automation built into it, from energy to water to electricity. We kept this building from being demolished and going into the landfill, which is unfortunately pretty common for buildings like this. We have given it another 50 years of life. Who is Impact Hub's ideal tenant? SS: We ask people to talk about what they're doing, how they can contribute to the hub community, and what they want to get out of the community. This is part of building a community of entrepreneurs and people who are making a difference in their community. It's kind of self-selected; we want people to be here mostly because they want to be here. We tell people what we're about, and then they determine whether or not that matches the vision of where they want to be. Why the move from the former Exchange Place space? SS: This is where we have always intended to be. Exchange Place was always a temporary location, while we were building this space out. Dustin Haggett: We secured this space two years ago in June, and then from November to December, we had a crowdfunding campaign to fund the hub. We presold $52,000 in memberships and started to design the space. Is Impact Hub meant to provide businesses with a permanent location? SS: There are people who are small, professional-service oriented that might be here for a long time, but many of the companies that come to the hub, as they start to scale, and as they build and stabilize, move on. That's the nature of startups. Many are growing, and won't need to be here forever, and that's OK. There will be others that will follow in behind them. There's a fair amount of turnover, and that's expected in a co-working space like this. That doesn't mean they have to leave the Hub community. That's an important part of our networking—those that are successful, we invite them back to share their positive experiences. DH: All of our furniture is a mix of locally built or from Herman Miller, one of the more environmentally conscious furniture makers. When you walk in, the first thing you see are the lounge areas. We wanted those to be accessible to the café so people can have informal, but also epitomizes that we want this place to feel like home. It's a very casual place, people meet and greet there, and it's a fun place to pull aside, conduct business, informal and formal. Flexibility is built into just about everything that is here.